Effective leadership and management are essential to the success of any organization. In the public safety realm, fire service leaders must address some of the same challenges found in any business but must also overcome unique obstacles such as political pressures, employee entitlement, insufficient pay scales and many more. To better prepare officers to meet these challenges, GPSTC’s Georgia Fire Academy offers a four-level Fire Officer series of courses that provides students with the tools and training they need to perform successfully. From basic interpersonal skills to advanced strategic departmental planning, the Fire Officer curriculum addresses all levels of management within the fire department organization, from Lieutenant to Fire Chief. Candidates who enroll in the Fire Officer series will gain the supervisory training necessary to ensure organizational success and prepare their departments for the future of the fire service. Upon successful completion of the courses at each level, students will be eligible to take the Georgia Firefighters Standards and Training Council’s tests for ProBoard Certification as defined by NFPA 1021, Standard for Fire Officer Professional Qualifications. It is strongly recommended that an individual follow the curriculum sequentially from Fire Officer I through Fire Officer IV, but students may attend the courses in Fire Officer I and II in the order that best fits the schedule of their department. Testing for Pro-Board certification, however, must follow ProBoard prescribed order with the pre-requisite training in place. 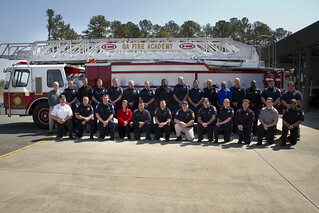 Students who have completed all courses or their equivalent can test for the different levels of Fire Officer Certifications through Georgia Fire Standards & Training Council. Pre-requisites are defined by the Council and certification testing is separate from the Georgia Fire Academy training courses. Testing for certification must follow ProBoard prescribed order with the pre-requisite training in place. For more information on testing, please contact the Georgia Firefighter Standards & Training Council at (478) 993-4521.